Which Pressure is Required for Your Sprinkler System? Water pressure is measured in pounds per square inch – also called psi. The average water pressure for most homes and businesses is between 30 psi and 50 psi; most sprinkler systems are designed to use pressures of around 30 psi. You can measure the water pressure at your site with a flow meter or water gauge attached to an outdoor faucet. 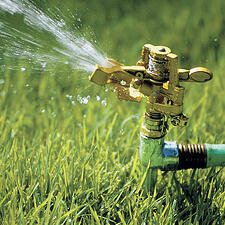 When determining your sprinkler needs, use the lowest pressure reading to ensure the best functionality. Spray heads and rotators. Most spray and rotator heads are designed to work their best at about 30 psi. When pressure is lower, the watering radius will be reduced, so you may need to place your heads closer together to get the coverage you need. Higher pressures – those above about 40 psi – will cause the head to mist or fog. Most systems have adjustment valves to help control misting. Pressure regulators installed along the main line can also be used. Rotors. Rotors are designed to work best at pressures exceeding 30 psi. If your water pressure is already high, a rotor is a good choice for you; if your pressure is low or average and you need a rotor to water your landscape effectively, you can use a boost pump to increase pressure or adjust the spacing of your rotor heads to help make them more efficient. Drip heads (also called drip emitters). These heads are designed to work best at about 20 psi; high pressures – typically those exceeding 40 psi or 45 psi, but sometimes lower – can cause emitters to break apart. What if my system uses more than one type of head? Systems using more than one type of head are designed based on the highest pressure required by the components; valve regulators are often used to reduce pressure to low-pressure heads. What happens if water pressure is too high or too low? When pressure is not adjusted properly, your system isn’t going to operate the way it was designed. Pressure that’s too high can result in sprinklers that produce a mist or fog, resulting in water waste and higher operating costs. High pressure can also increase the wear and tear on your system. Some systems can be fitted with special valves that keep the pressure at an ideal level. Low pressures mean your sprinkler will not be able irrigate the area it’s intended to cover, resulting in dead patches of lawn or garden. For low-pressure lines, boost pumps can often be installed to help increase the pressure to your sprinkler heads. It’s also important to note that pressure can change along the length of a system, most commonly as the result of a change in elevation: water running down a slope will gain pressure while water running up a slope will lose pressure – generally, about 0.433 psi every foot. Your irrigation system can be a big investment; if it doesn’t work properly, your budget and your lawn or garden both suffer. Because there are a lot of variables that determine how well a sprinkler system functions, relying on the advice of an irrigation professional is the best way to ensure your system works well for years to come.